antiquesandmore100 has no other items for sale. 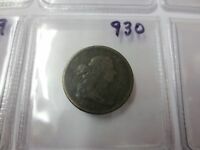 1855 Braided Hair Half Cent, NGC MS63RB, CAC Approved! 10% Restocking Fee for ALL return requests made where the item was paid for through PayPal. NO EXCEPTIONS. By bidding/purchasing you agree to these terms. **Due to PayPal's new policy where they will not refund seller's fees starting in May 2019 on returns & cancelled orders Cash on Pickup Available & I will honor my 14 Day Return Policy for items purchased via "Other"